Designed as active alpine insulation for cold, high-output days of skiing, climbing, snowshoeing or hiking, the Men’s Helix Vest combines sustainable materials with a technical design. In the body Icebreaker used their MerinoLOFT™ insulation, which provides a warm, breathable and natural alternative to synthetic insulations. The 100% recycled polyester face fabric features a DWR that sheds light precipitation. Merino jersey stretch side panels help regulate body temperature on active days, and the 100% woven merino lining ensures a cozy feel inside. Zippered hand and chest pockets keep small essentials like lip balm, snacks and your phone close at hand. 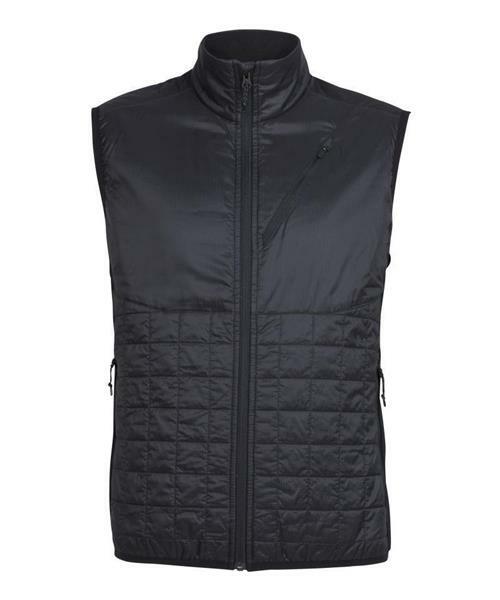 Helix Vest - Mens is rated 4.8 out of 5 by 19. Rated 5 out of 5 by acmcdonaldgp from This is the Ultimate Vest I have worn a lot of vests over the years, but this one truly is the ultimate. I wanted a mid layer vest ylthat is warm, low profile, and can also be worn alone with a hoodie or flannel. This one does it all. The Merino loft is warm and the athletic/slim fit makes it a perfect mid layer. The flex panels give it the stretch to layer something else under it. As warm as it is when used as a mid, it also breathes very well and temp regulation is ideal when wearing it. I’m 6’6”/255 and the XL is the perfect fit and length. The breast/chest pocket is large enough to be useful and the side pockets are perfectly sized. Rated 5 out of 5 by Griffon2 from SPEAKS FOR ITSELF This is the third Helix vest I have purchased for myself, along with two others for family members. I wear them daily around the house in winter and will likely do so indoors and out in the shoulder seasons. Rated 5 out of 5 by DuaneN from Great outer/mid layer Awesome vest to keep your core warm on those cool days, as well when used as a mid layer under a jacket. Used this as a mid layer cross country skiing and was kept warm in -10. Rated 5 out of 5 by Happyinthewest from This vest survived -30 degrees C Recently purchased this vest when the temps plummeted and was very glad that I had. It is very comfortable to wear over a shirt in the house or under a coat when going out doors. It has a very good zipper closure and roomy pockets (including a handy phone pocket). It surprisingly keeps you warm and toasty without added bulk (unlike my old fleece vest) and is feather light - I highly recommend it. Rated 4 out of 5 by Lovethewintergirl from The jacket version rocks! My recent purchase of a Helix vest is for a Christmas gift. I know the recipient will love it. I have lived in my Helix jacket since I bought it a year ago. It still looks good after a year of almost daily wear. I love the weight, the comfort and fit. It is stylish enough to wear daily but for me it's main use has been for cross country skiing and in the back country. Rated 5 out of 5 by Alpine1 from Helix vest I bought this vest as a midlayer for a new shell jacket. Simply excellent so far. Right size, very warm, not bulky and in my opinion, a better look than Arcteryx. I have not tested it in a cold, rainy situation. The mobility of the vest compared to my old fleece is vastly superior. Rated 5 out of 5 by Tballs from Great Vest I use this as a daily vest under light jackets and as a vest on bike rides in the fall. As soon as x skiing is in season I will use it then also and expect it to work great. I would buy this vest again and may just to have one for sports and one for casual urban wear.